The defendant’s personal gain aside, what he is doing highlights how the rules have changed. At the heart of the fight is a Web site started by Mike Morgan, the real-estate broker, to collect complaints and dispense advice about what he considers shoddy workmanship on homes built by Miami-based Lennar Corp. Previously, companies might have felt free to ignore campaigns like these. But they’re increasingly taking them more seriously as the Internet makes it easier for campaigns to spread nationally. Still, rarely do they spark such broad counterattacks from their targets. Years ago in Charlottesville, a builder sold a house to a buyer. Immediately the buyers discovered many flaws and defects they wanted to builder to remedy. He wouldn’t. 1) It shouldn’t have taken relatively extraordinary steps to get the builder to remedy the problems. 2) Today, the bar for educating others on builders’ faults and accomplishments is much, much lower. 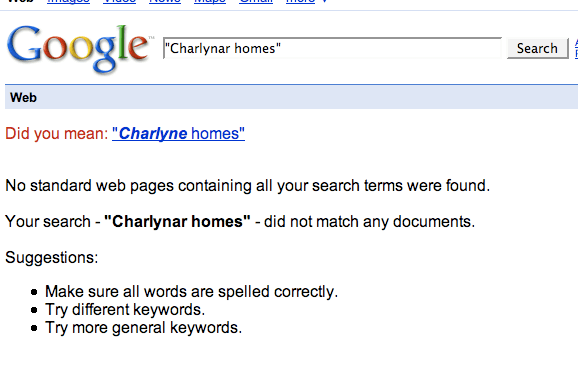 Google “Charlynar homes.” Today, there are no results in Google for this search. Soon, likely Google will find whether Charlynar Homes is a good or bad builder. I’ll post an update in a couple of days. Builders would be remiss not to monitor the blogs and their reputation on- and off- line.Â AideRSS may be one way to monitor one’s reputation. As any good researcher would do, I searched Wikipedia for Slander and Libel laws and came to the legal determination that so long as the information is factually accurate, you’ll be just fine (you may want to consider consulting with an attorney yourself with more legal training than a blogger and Wikipedia). In speaking with a political lobbyist yesterday about some politicians’ trepidations about blogs, one of the points he made was that some were reluctant to accept blogs because they couldn’t control the message. Controlling the message may have been possible when media options were limited. That time has come and gone. Builders, politicians, business people need to accept that fact. Controlling the message is no longer a possibility. Contributing to, and being a part of the discussion about your business, whether that is real estate, politics or Charlynar Homes is where the focus should be.